Facebook took its App Center live on Thursday at a slick media event in San Francisco, announcing a handful of previously undisclosed features. The social networking company announced in May that it would launch an App Center to highlight high-quality social apps that run on its platform. On Thursday, the company gave a brief demo of the feature. The App Center, which users will be able to access from the left-hand navigational menu on their Facebook landing pages, will feature personalized app recommendations based on an individual user's interests and previous activity. The apps can also be searched by category, such as "games" or "lifestyle." Matt Wyndowe, a product manager, said that when employees tell their friends about the apps available on the Facebook platform, they are often asked: Where do I find them? "To be honest, we haven't had a really good answer," Wyndowe said. The App Center includes ratings for the apps, descriptions and screen shots to help users decide whether or not to download a given app. Each app's information page in the center may include a "send to mobile" button that, when clicked, will send a link to a download location to the user's mobile phone. 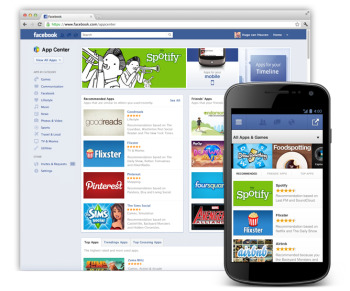 The App Center highlights apps that integrate with the Facebook platform, but it doesn't host them. Rather, it points users to the App Store, Google Play or a website where download is available. The App Center launched with more than 600 apps featured, Wyndowe said.